A knife sanitizer helps your staff quickly and easily keep your cutlery clean for future use, so you can adhere to health codes. We offer sanitizing systems that use liquid sanitizers and ultraviolet light to clean knives efficiently. Simply clean your knives as you typically would, and place them in your knife sanitizing system for the designated amount of time to remove nearly 100% of bacteria. This design eliminates bacteria that regular washing won't remove or dirt that collects in spaces that are harder to clean. 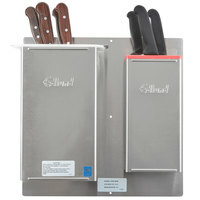 Our systems are NSF Listed to help you adhere to sanitation regulations, and they can fit many knives in their case at a time. 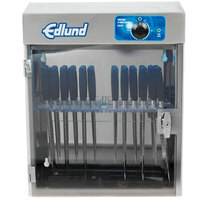 Our ultraviolet knife sanitizer cleans up to one dozen knives at a time from handle to tip, while our liquid sanitizing systems submerge your knife blades in sanitizing solution. 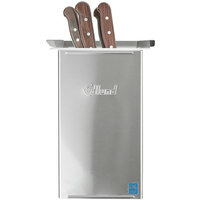 Once you remove knives from the liquid sanitizing system, simply let them air dry to make sanitation simple.